← Greatest NHS Property Sell-off Ever! April 16 (April 3 in the old Russian calendar) marked the centenary of the return to Russia from exile of V.I. Lenin. 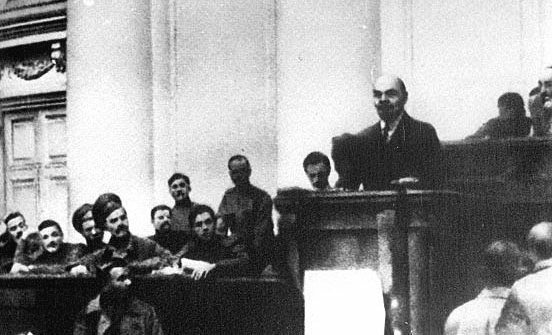 The following day Lenin addressed a meeting of the Bolsheviks and gave his famous April Theses, which outlined the line of march for the communist party and the working class in Russia following the February (March) Revolution of 1917. These ten theses were subsequently published in the Bolshevik Party’s newspaper Pravda as The Tasks of the Proletariat in the Present Revolution. Lenin’s April Theses were presented in a situation where the Tsar and his regime had been overthrown by the actions of the masses organised in the revolutionary soviets (councils) of workers’ and soldiers’ deputies. However, “a lack of class consciousness and organisation of the proletariat” had meant that although important democratic rights had been won, governmental power had been assumed by a Provisional Government, dominated by the representatives of the big capitalists and wealthy landowners, although including some who referred to themselves as socialists. Thus, although a revolutionary situation existed throughout Russia, the class character of the government meant that in several important respects its policies differed little from those of its predecessor. It continued to sacrifice millions of Russian soldiers in the slaughter of the First World War by honouring the treaties to re-divide the world agreed by the Tsar with the governments of Britain and France; it did nothing to solve the acute economic crises and poverty facing the masses of people in Russia; nor did it take any measures to redistribute land, the most important means of a livelihood for the majority. Lenin’s theses were based on the concrete analysis of concrete conditions, the conditions as they existed in 1917, and not on a dogmatic rendering of Marxism and the world. They outlined the nature and stage of the revolution, pointing out that the country was going through a transition from an anti-feudal, or bourgeois-democratic, revolution, that had placed the capitalists and big landowners in power, to a socialist revolution that would place power in the hands of the working class and small farmers. There was in effect a situation of dual power in Russia, a trial of strength between a bourgeois government, on the one hand, and the new revolutionary power of the Soviets, on the other. In his theses, Lenin presented the line of march for the communist party, pointing out that it had the task of patiently preparing the working class to empower itself and successfully establish its own sovereignty by establishing a new state power based on the soviets. In this regard, Lenin’s views differed from many who considered themselves Marxists. They considered that the capital-centred system and the class rule of the big monopolists and financiers was destined to last for any years. Lenin took a contrary position, based on the view elaborated in his Imperialism the Highest Stage of Capitalism (1916) that as a result of the war and the uneven development of capitalism, it was indeed possible to breach the imperialist system of states at its weakest link and move from the first to the second stage of the revolution, which as Lenin said.,”must place power in the hands of the proletariat and the poorest sections of the peasants”. Poster reads: All power to the Soviets! Peace for the people! Land to the peasants! Factories to the workers! In his April Theses Lenin highlighted the important role of the revolutionary party as the organiser and far-sighted leader of the working class, that can provide the class with the theory to guide its forward march. He explained the importance of the Soviets, as the only possible form of revolutionary government and that it was only this form of government, based on the majority, and defending their interests, that would end the war. He called on the communists to expose the political errors of the leaders of the Soviets, and those under their influence, who at that time preached faith in the Provisional government, demanded a continuation of the predatory imperialist war and were content with a parliamentary system of government. Lenin called on the communists to explain their views widely amongst the workers and especially in the armed forces. They were to demand no support for the Provisional government and in addition to agitate for: the abolition of the existing state institutions, police, army and bureaucracy – all officials were to be elected, liable to recall and paid only the average workers’ wage; the nationalisation of all land, which was to be used in the interest of the people under the direction of peasants’ and farm workers’ soviets; the merging of all banks into a single national bank also under the control of the soviets. The April Theses also demanded that the Bolsheviks, who had formed the majority in what had been called the Social-Democratic Party in Russia, change their name to the Communist Party. Lenin argued that the Communists must distinguish themselves from others who called themselves socialists and even Marxists, both inside Russia and outside, but had totally betrayed the revolutionary principles of Marxism, particularly in their social-chauvinism and support for the inter-imperialist First World War. In the same context, Lenin also proposed the creation of a new revolutionary International, or organisation of revolutionary anti-war parties, against the social-chauvinists and against the “Centre”. This subsequently became the Third (Communist) International, to replace and expose the betrayal and class collaboration of the Second International. Lenin’s April Theses were an indispensable guide not just for the Communists but for the working people of Russia and for the eventual success of the Great October Revolution. They highlighted the fact that the struggle for the new continued even in the period after the February (March) Revolution, that the masses of the people were still in motion and that their aims and interests could be met neither by a parliamentary system nor by a pro-war government which represented the interests of the monopolies, financiers and big landowners. In his Theses Lenin showed that the workers needed their own revolutionary forms of democracy and a new state defending their interests and that these must be based on the new institutions that the people themselves had created, the Soviets, the instruments of the practical politics of the ascendant forces. 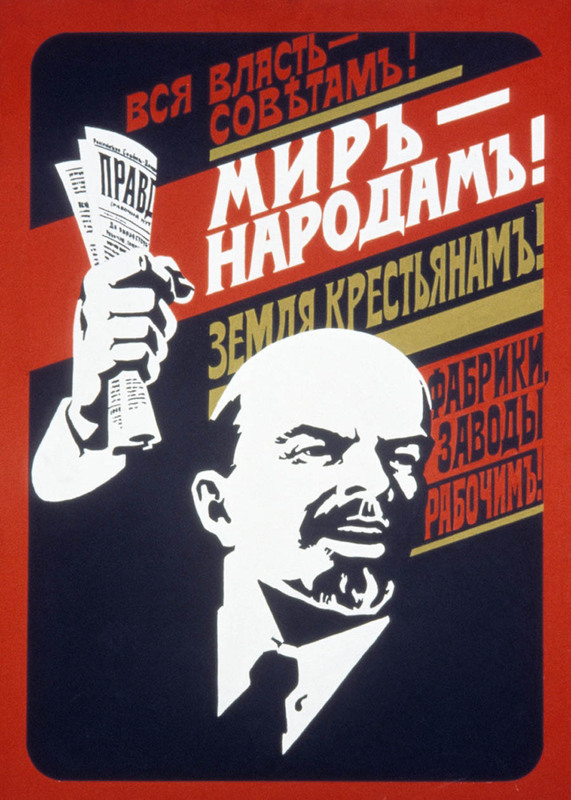 Lenin’s April Theses also highlighted the vital role of the Communist Party as the leader and guide of the working class and its allies and the necessity for such a party to be an advanced detachment of that class, able to adapt its strategy and tactics to solving problems as they present themselves. Lenin’s Communist Party in Russia adopted the April Theses and in the months following gained increasing support in the Soviets. The Provisional Government and all those who supported it were thoroughly exposed as defending the interests of the rich, unwilling to end the war and unable to solve any of the economic, social or political problems facing the majority. It was in these circumstances that the demand for “All Power to the Soviets” was advanced and subsequently realised through the Great October Revolution through the actions of the masses led by the communists. Far from being a coup by a minority as has been suggested, it was rather the resolution of the revolutionary crisis which had existed in Russia for most of 1917, a resolution in which for the first time in history the working class and its allies empowered themselves and ushered in a new era in human history. It is an era which has the aim of the emancipation of the working class and all of humanity.